It's that little blue box some minecraft youtube videos have on the top of their screen that tells them what they are looking at. Like a tooltip but for blocks. It also says what mod the block is from. The king is back. Long praise the king! Thanks Prof. We really missed you :)! Now if he would only update JABBA! But yes, welcome back. my laptop doesn't have a numpad and I don't have my external keyboard with me is there another way to active this mod. You can change what key to activate WAILA in Minecraft under Controls. 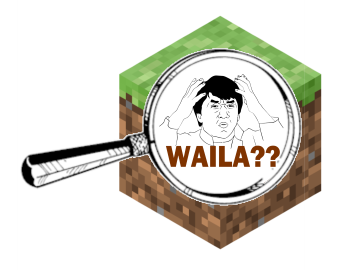 when will WAILA be out for minecraft 1.11.2? I am makeing a privite mod pack for me and a few friends in minecraft 1.11.2 but I cant add WAILA because it is not up to date. Because that's the version of the mod itself and not Minecraft. Notice that it says "1.5.2a" instead of just 1.5.2. Hope this clears it up! I dont understand the color codes. Maybe someone else would be better suited to maintain this mod? ProfMobius seems to be MIA! Sorry if the question has already been asked and answered but I can't seem to find any info on the subject; have the numbers that represent the vanilla blocks been removed from WAILA? I know they still appear with the 1.7.10 version but in 1.10 .2 they don't. They are useful for cheaters like me when using World Edit. With advanced tooltips (F3+H) turned on, the block ids show up in Waila in 1.10.2.